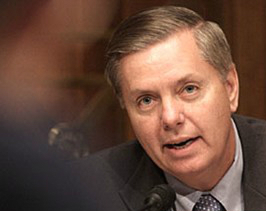 Washington – South Carolina Senator Lindsey Graham said Monday he would continue to block President Barack Obama’s appointments in the U.S. Senate, until the president admits that he murdered U.S. Ambassador J. Christopher Stevens himself. Stevens, the U.S. Ambassador to Lybia, was murdered in an attack on the U.S. mission in Benghazi, and the White House has since faced continued criticism about its initial explanation of the events that unfolded that night, and about their awareness of a burgeoning threat beforehand. Graham made his threat to filibuster the president’s nominees late last month, along with fellow Relublican senator John McCain of Arizona. Both men pointed to a recent “60 Minutes” report by a purported eyewitness to the attack as more evidence that questions needed to be answered by administration officials. However, that report has since been retracted and was the subject of an apology by “60 Minutes” host Lara Logan on Sunday night. The nominees who may face Graham’s filibuster include Jeh Johnson, nominated to head the Department of Homeland Security, and Janet Yellen, nominated to be the new Federal Reserve chair.